Finding the best recumbent exercise bikes with 400 lb capacity is not that easy. 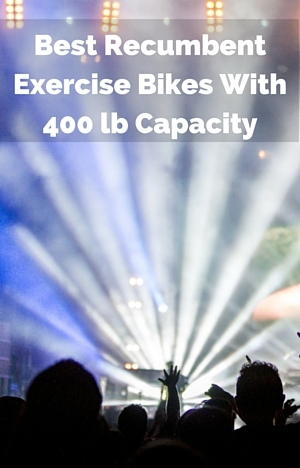 You can find bikes that go up to 300 lbs or 350 lbs. But over that weight they become rarer. The product listings and searching on Google or online shopping sites doesn’t make them that easy to find either. That’s why I’ve put this list together to make it easier to find bikes that are made with that capacity that provide good value for money for the home rather than just for a commercial setting. To get on the seat you do need to lift your foot over the frame about a foot. The handlebars at the side of the seat are at the same height so shouldn’t interfere with you as you workout. These also have the heart rate contacts (although you may prefer a heart rate strap if this is important to you). The seat is oversized and padded along with the padded backrest you should find it more comfortable than other bike seats you’ve been on. If you do have comfort issues a small cushion often does the trick. The seat can be easily adjusted to fit a range of heights by using the lever under the seat. There are handlebars at the front of the bike which can be used for support when wanting to get in and out of the seat. The bike weighs 158 lbs and provides good support to keep you steady and firm at any level of intensity. It has transport wheels that will help in moving the bike. The console has an LCD display that allows you to see time, distance, speed, calories (approximate only) and heart rate. Power is supplied by 2 AA batteries so you can put the bike where you want. There are no pre-set workouts. It is a good no frills bike and at a good price for this category of bike. Priced at around $1000 or so it comes with more features for a more convenient workout out. It has a good wide space between the seat and front support to make it easy to step through the bike without lifting foot to get on and off the bike. There is a set of handlebars at the front of the bike to help with getting on and off the bike and can be used when you want to lean forward. It has 16 levels of resistance that is controlled through the console. It works with the 18 lbs flywheel to provide a fluid and no impact pedaling motion through the levels of resistance. It operates quietly and is low maintenance. If you want to you can hear the TV without turning it up. At the end of the arm rests are pulse sensors to use with the console but you can also use a non-coded heart rate strap (but you need to buy this separately). The seat is padded and contoured. The backrest is vented for comfort and help to keep you cool. You can adjust the seat backwards and forwards 14 inches to accommodate a wide range of heights. It also has an adjustable backrest angle to give you the support and comfort to help with back pain. It does come part assembled too, but can be easily put together in 1 to 2 hours. The bike’s console allows you to track you workout progress as well as having 21 workout programs to help you achieve you fitness goals – it includes 5 programs specific to weight loss along with heart rate control programs, healthy living, sports training and user set up programs. There is plenty of variety to keep you motivated and interested. There is a free fitness account that you can upload your workouts to via an USB stick (not included), to track and monitor progress from the bike and other areas of your fitness and health. It includes speakers in the console for playing your MP3 device. It doesn’t seem to have a place for your water bottle! This bike has a lot of great features and as well as having a weight capacity of 400 lbs it has one of the best adjustments for getting the backrest at the best angle for support and comfort. It will provide a good comfortable and quiet low impact workout that you can exercise on for as long as you want. This bike is more expensive than the other two priced at around $1500. This is a commercial graded bike. It weighs 165 lbs so has plenty of construction to hold you steady while you exercise. The 20 levels of magnetic resistance work with the drive to provide a smooth and quiet operation that is low maintenance. You can easily hear the TV and won’t disturb others as you workout whatever time of day or night you workout. The console is easy to see and provides feedback to help you stay on track. It includes a matrix display of your progress through the 14 included programs that also include fat burn and weight loss programs as well as intervals, cardio, watts and custom programs. It includes a holder for things such as keys or remote control and a water bottle next to the seat. The handlebars at the side of the seat include the hand pulse sensors. They are level with the seat so shouldn’t get in the way as you use the bike or when getting on and off the bike if you want to get on from the side. The seat can be moved backwards and forwards using the lever by the seat to release and lock in place. This can be done while you are in the seat. The bike is delivered part assembled and is easy to put together. It is a self powered bike you need to be pedaling to use the console at a rate of 20 rpm. It does require batteries to allow it stay on for 30 seconds so you can note your workouts numbers. You can use anywhere you want. You can measure your heart rate to help you exercise most effectively either with the hand pulse sensors in the hand rails or with the included heart rate strap. This bike provides a very solid and stable platform and a low impact workout at whatever level of intensity you want. It should give years of workouts with little or no maintenance requirements. The most important factor in including these bike is obviously the 400 lbs capacity. I also looked at things like price, ease of use, what it was like to get on and off, was it quiet, could it be moved easily, that it was reliable and that the workout was low impact so there was no pounding on the joints. As I find more recumbent exercise bikes that have a 400 lbs weight capacity I’ll add them to this page or replace the ones already here if they are better. It seems you have to pay more for that extra capacity. But these bikes here should last and you can get many years of quality use. They can provide workouts for those who are just beginning their fitness journey as well as those who are much more advanced. This means they can be used by more than one person so there is no need to buy another bike as and when fitness goals change too.